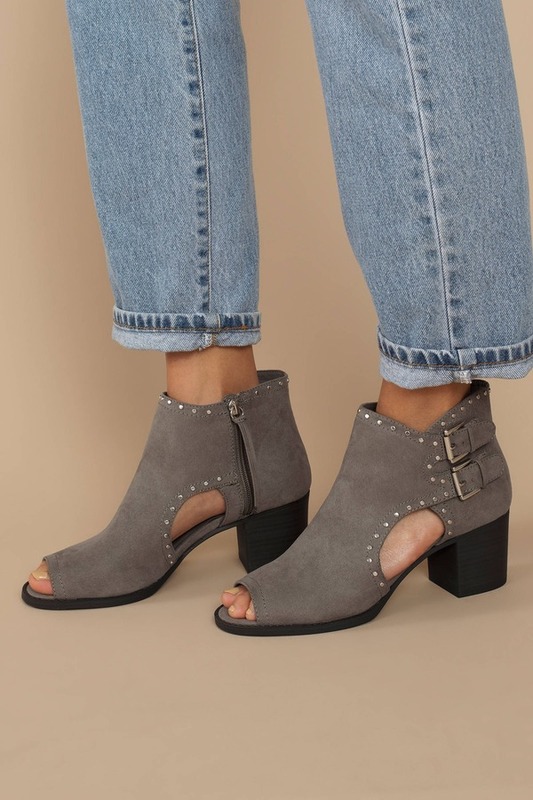 Check out Tobi's Tensley Studded Suede Booties Walk in confidence with Dirty Laundry's Tensley Studded Grey Suede Booties. These suede ankle boots feature a peep toe, studs along the hem, cut out details, and two buckle straps on the sides over a block heel. Let these comfortable heeled booties take you through fall. Walk in confidence with Dirty Laundry's Tensley Studded Grey Suede Booties. These suede ankle boots feature a peep toe, studs along the hem, cut out details, and two buckle straps on the sides over a block heel. Let these comfortable heeled booties take you through fall.